Bad cell reception after replacing LCD, golden prong issue? My iphone 3GS recently was dropped in a parking lot and possibly run over. Anyway, when I got it, it didn't look so hot, but it would ring when you called it, so I replaced the LCD and Touch screen per your instructions and parts and everything went smooth and looked good. After using it a few days, however, I noticed that the cell reception was horrible, even when it indicated full bars and a signal. Everything else works fine (GPS, wifi etc), just the phone and 3G signal. I can sporadically get it to work, but it usually fails, sometimes after making an ugly garbled static-like sound. I opened it back up, re-checked all the cable connections and everything looked good. Also made sure the #7 cable was securely connected. I've read some of the boards and it sounds like an issue with the "golden prong" . From what I've read, this prong is supposed to connect to the Bezel to ground the antenna. I found what I believe is the "golden prong", on the underside of the screen when you first open the case. I don't visibly see where it connect to the bezel (am I supposed to be able to? ), and there don't appear to be any good close-up photos of this here, but the images I've seen in some of the repair instructions and break-downs seem to be the same as what I see on mine. I'm not sure how far out the prongs are supposed to extend, but they seem like they are supposed to contact 2 metal squares that sit opposite them when you close the case. I have pics if I can find a place to post them here. I think some good pics of this area would be helpful to others having a similar issue. Any recommendations for testing or checking this, or other thoughts on another likely cause of the bad reception? Aha... those prongs I'm describing are certainly the home button prongs (they are right next to it), but they were the only "golden prongs" I could see. I now see the ones you are referring to. They look OK from here; I'll check into the dock connector replacement.... do all dock connector assemblies come with antenna as part of that assembly? they should do if you buy "complete assembly"
Thank you both for your response... Hector, I don't really know what the "inductor" looks like, or what orientation you're using when you say "to the right" of the #7 connector, but if I'm looking at the #7 connector, with the dock connector facing me, to the lower left is a ribbon connector coming out of what I believe is the mic. Above it is the logic board shield and logic board. To the right (from this orientation) I see the golden prongs and if I disconnect and lift up the #7 cable, I see the "do not remove" sticker etc. I believe the "Golden Prongs" I'm referring to are the inductors? They are both there at any rate and appear undamaged and right up against the side of the bezel. I know you can also buy just the antenna flex cable; would you recommend that or the whole dock assembly? I've heard of issues with people replacing the whole dock assembly, and then certain parts of it (like the mic, or the dock port, or the antenna) not working as well as the originals. 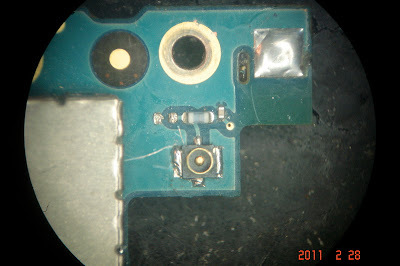 It is looking at a iphone board on its side with the #7 connector at the top right, and the #6 would be at the lower left if it were in the picture. The large hole you see is the screw hidden by the "DO NOT REMOVE" sticker. Do you see the little rectangular components below that screw hole and above the #7 connector? They are light in color and have a copper wire wound around them. In the pic I posted, the one on the left is missing (2 solder points), while the one on the right is still there, and all the way to the right is a small resistor. The inductors would be those on the left of the resistor. If ANY of them are missing, you will have reception issues. The golden prongs you speak of are just the grounding prongs for the board and the antenna. As for the dock/antenna issue, I, myself like replacing only the parts necessary and keep the original Apple parts that work. You're right about the quality of those replacement parts being inferior to the original ones.